With the integration of data from ProjectOpen in Odoo, we combine the advantages of a project management tool with Odoo to generate the maximum benefit from both systems. Our module allows you to create, track and manage projects seamlesly with quotes and invoices including a team time reporting. All necessary information for your sales and finance department remain in Odoo available for associated business processes. Hours reported in ProjectOpen can be imported in Odoo and will be allocated to the according task and project. User and resources from ProjectOpen can also be imported or entered manually in Odoo. After the setup reported hours can be allocated to the corresponding employee or resource. With our module all projects from ProjectOpen are available in Odoo. With this functionality you can adopt estimated or reported hours from ProjectOpen in Odoo to create quotes or invoices based on this data. Based on your selection, you can assign appropriate projects to reports in Odoo (quote or invoice). 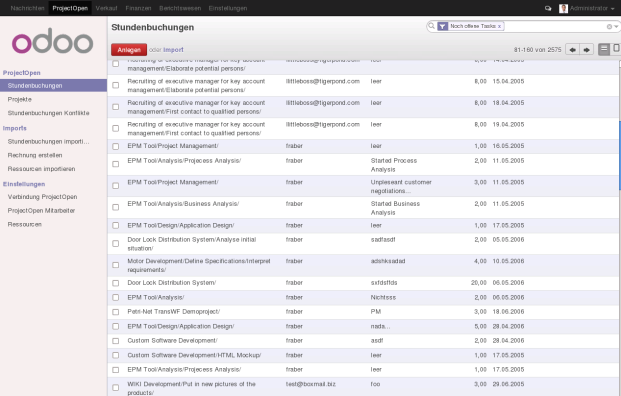 The data from ProjectOpen will be displayed in Odoo and is available for quotes and invoices. Imported or updated hours from ProjectOpen are automatically assigned to the corresponding tasks by the wizard. If values are modified by importing updated data, the according changes in Odoo are color-coded. After importing data from ProjectOpen in Odoo you have the possibility to adjust data and values. Interested? We are happy to show you the functionality of our module in a webcast.